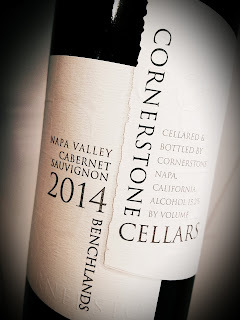 The wines of Cornerstone Cellars have been around for nearly three decades, and the company has seen its share of change through the years. One thing that appears to have stayed the same over time is their commitment to crafting excellent Cabernet Sauvignon wines in Napa Valley. The recently added winemakers in Yountville, Charles Thomas and Kari Auringer, are guiding the good ship Cabernet now at Cornerstone. Thomas has a 30 year track record in the Napa Valley, and Auringer is in her second go-round with the winery. This great wine is made from Rutherford fruit, 92% Cabernet Sauvignon, 5% Merlot 3% and Cabernet Franc. The alcohol level is lofty, at 14.9% abv, and it retails for $65. The Benchlands Cab is dark and rich. A nose of blackberries, plums and cassis is layered with leather, spice and oak notes. The aromas are nearly a dead ringer for a Syrah, but that impression goes away on the sip. It's definitely a Cab, and it's a really bold one. The wine is so complex that it seems new flavors arise on each sip. The acidity zings, the tannins grip and the finish lingers on a medium while.